The goal behind cheating strategies is to increase the rate of winnings. Since these winnings cannot be obtained by the means of a legal conduct, more and more gamblers have got used to using illegal measures. Before you come to hasty conclusions, you should know that encouraging you to do the same is the last thing on our minds! On the contrary, we recommend you to avoid using cheats, as they do not reflect a positive example! With only a reduced number of exceptions, almost all of the casinos use hi-tech cameras and other surveillance gadgets that can make the difference between a common player and a cheater. As a result, the odds of triggering fabulous sums of money in an unauthorized manner, is extremely low! 'Cards blotting' is a common term in the vocabulary of gamblers. Card blotting occurs when the players decide to mark the cards, in order to make them more recognizable. This phenomenon is common for almost all card games, but especially for blackjack! One can't enough emphasize, how important it is to make these signs secretly! Bending and scratching are two of the most well-known methods, when dealing with the phenomenon of card blotting, but of course there could be many other signs! The less visible the sign, the better! The most famous of all cheating systems is the one, where gamblers hide the cards before venturing into the casino. At this stage, one can really call himself a magician, you see, moving a card to your sleeve, while replacing it with another one, requires nerves of steel and fine-tuned handling skills. Waiting till your opponent shows some cards involuntarily, might sound as a never-ending task, nevertheless more and more gamblers apply this technique. A skilled gambler will almost never reveal his cards, and therefore you should put everything into balance, before attempting to experiment! 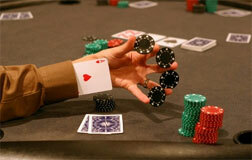 No matter the game (online or land based), gamblers will always try to defy the logic behind a well elaborated system. Putting additional chips, while playing online roulette and/or craps is a good way to start your day, nevertheless you cannot continue doing this till the end of the times. There will be always someone or something (such as a security camera) to unveil the trick behind your 'modest' attempt! Gamblers aren't the only one to use cheating systems. As a matter of fact, it was the casino, who first started utilizing techniques designed to change the outcome of the game! There is a strong tradition in this respect nowadays; hence you can see casinos that get to be closed down. Whenever you spot any doubtful attempts, feel free to leave the casino and return once their license has been given back. Regardless whom you represent, you should know that cheating is illegal and is prone to locking you away from gambling, for a good time!